Pictured left to right: Kamilah Crawley, Cornelia Santschi, Venus Banks, David Venezia, Orlene Cummings, Mercedes Valle. 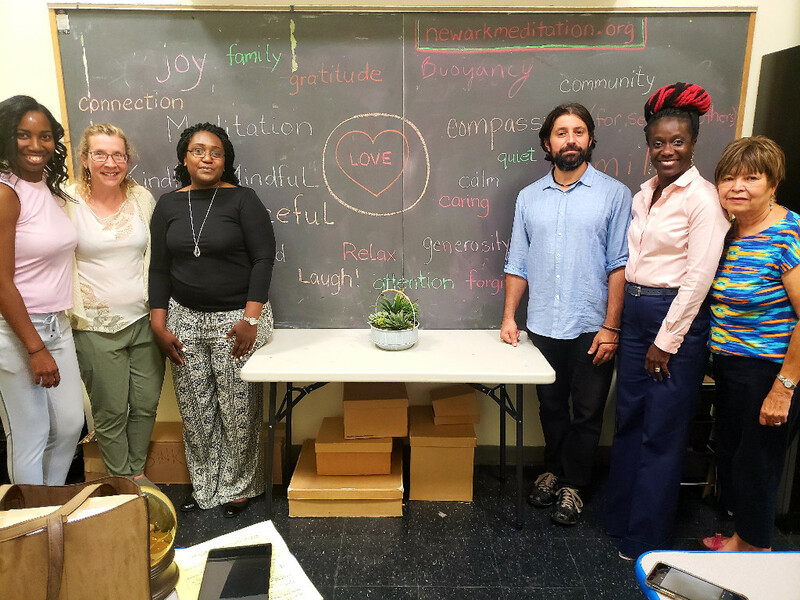 In the late afternoon of June 8th, Newark Center for Meditative Culture gave Family Mindfulness Workshops during the Early Childhood Night at the Newark Museum. We were delighted to have been invited to share our expertise. Our Family Kindful-Mindful Team included Cornelia Santschi PhD, a neuropsychologist, who led the team of instructors, Kamilah Crawley and Venus Banks who planned and organized as well as instructed, instructor David Venezia who with Andrea Lee helped in session development, and Orlene Cummings and Mercedes Valle PhD, who assisted in facillitating the workshops. Corresponding with Venus, an educator in Newark NJ and area, she feels that workshops like these provide tools to help young people establish lifelong healthy behavior patterns. She further emphasizes that establishing healthy behaviors during (early) childhood is easier and more effective than trying to change unhealthy behaviors during adulthood. Working in the Newark Public School System for most of her career as a child psychologist, Mercedes has been engaged in working intimately with children and parents. She says she practices kindness because she feels the earth belongs to all and that caring and loving each other makes a better world. Though we issued a limited amount of surveys, most surveyed indicated that they were now likely to practice mindfulness with their family. Most of the caregivers surveyed also thought that their children enjoyed the mindfulness workshop “quite a bit” to “a lot”. Our instructors were enthusiastic about the results of the workshops, and felt that they learned from the experience as well. They anticipate developing the workshops even further for different occasions. We are grateful to the Newark Museum, United Way, Newark Public Schools, and the Nicholson Foundation for the opportunity to be of service to the community with our Family Mindfulness Workshops. You can also stay up to date with NCMC’s programs by subscribing to the newsletter and following us on Facebook, Instagram, Twitter, or LinkedIn.